“A Frozen Holiday Wish” features Anna and Elsa in an all-new show on the Castle Forecourt Stage. 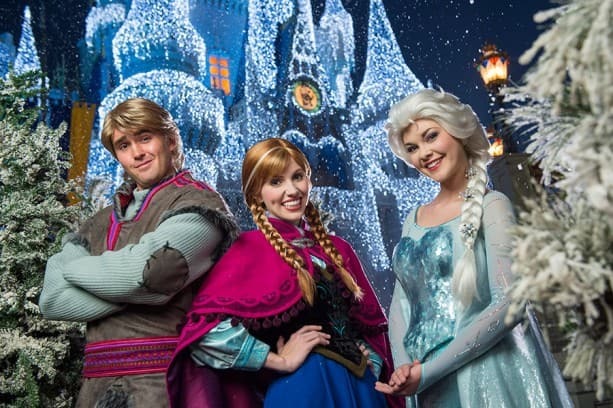 With special appearances by rugged mountain man Kristoff and lovable snowman Olaf, the show culminates in Queen Elsa using her incredible powers to present a gift to everyone in the kingdom, transforming Cinderella Castle into a glimmering ice palace for the holidays. “A Frozen Holiday Wish” begins November 5 and will be presented nightly through December 31, 2014. Will you see a performance of “A Frozen Holiday Wish” this season? Tell us in the “Comments” section below! I think I saw a commercial that said this show has been extended through the end of January. I am thinking about making the trip this weekend, 1/24/2015 with my daughters. Are we too late? I’ll be on 6.1.2015 will still have Christmas lights show the freezing of Frozen? We will be there 12/4-12/7- we would love to see the Frozen 6:15 show on Thurs or Friday- we have the Mickey’s Merry Christmas ticket – it says that with this ticket we can see the 6:15 show (on website) – I just wanted to make sure that when we arrive at 6:00 to see the show we are able to enter (even if the actual event starts at 7) – Is there a separate entrance – Do I need special reservations for my tickets-(add it on to my magic band) -What time is the earliest to enter to see the show (for seating) ?? Hi There! great blog you have here and nice to see all the answers to peoples comments. I will be at Disney during Christmas and ny this year. Any best spot to view the frozen show at the castle at 8pm (we have adr at 645 at liberty tavern on dec 24th, could always try to catch the 615 show). Do you think we have to find a spot way in advance of the show? don’t want to miss this show! Thanks. I’ll be there next week starting the 16th for the week. Depending on when we can get off from work, we generally try to do this week or the previous to take in the Xmas festivities. No better place to be in my opinion for this time of year. Not sure what day to do the Very Merry Xmas but will decide once we are there. If you are an adult with no kids then I would urge you to do Disney for the Holidays, it truly is magical place like no other. My girlfriend and I have been coming down there for the past several years and cant get enough. Also being from the North it doesn’t hurt to get out of the cold for a bit either. We also do Disney in February as well but by far the Xmas time is our favorite. We are heading down Nov 15 – 21. Can’t wait. How long is the show, just 10-15 minutes? I have an ADR at 6:30. Where would you suggest viewing this show? Is it on the main stage in front of the castle? How about a Frozen meet and greet during the MVMCP, or adding it to the Hollywood Studios dessert party? Will that happen? Please say yes! Aron – You can meet Anna and Elsa at Princess Fairytale Hall in Fantasyland during Mickey’s Very Merry Christmas Party, just as you can during the day. ‘A Frozen Holiday Wish’ begins on November 5, and runs through to December 31 2014. Show times are 6:15pm and 7:30pm on regular park days, and 6:15pm and 8pm on Mickey’s Very Merry Christmas Party nights. this is during the Christmas party and during park operating hours, when the party isn’t happening it shows twice i believe. It will be shown both days. My wife and I are more old school and while we understand that Frozen is the big thing right now, we enjoyed it when it was the Fairy Godmother who changed the castle for Cinderella. Is this only on nights without the Christmas Party? Edie – Every night through December 31! I too would like to know if they’re doing it twice a night. I need to figure out my ADRs so I don’t miss it! What time? I’ve heard they will do this twice nightly, 6:15 and 7:30 or 8? Trying to confirm times for Dec 9. Thank you! Bonnie – The show will be every night at 6:15 p.m., with an encore performance at either 7:30 p.m. (non-party nights) or 8 p.m. (nights when Mickey’s Very Merry Christmas Party is scheduled). yes!!! will be there on first night! do they do this at the christmas party or does the party have something different/special? thanks! Jen – There are lots of special things to see and do during Mickey’s Very Merry Christmas Party, including a second showing of “A Frozen Holiday Wish” at 8 p.m. That show will be the same as the one presented at 6:15 p.m., however. Sounds wonderful. I already booked to be at Disney with my family over Christmas break, will this show be added to the Fast Pass option?? I dont see it on the show listing yet. Tanya – You won’t need Fastpass+ to see the show. There is plenty of viewing available throughout the Central Plaza in front of Cinderella Castle. Yes, we will be there over Thanksgiving! So excited!! Is this a free show or do we need to purchase tickets in advance like the Mickey Christmas Party? Suzanne – “A Frozen Holiday Wish” will be presented every night and is included as part of regular Magic Kingdom park admission. We will be there December 24th- 28th!!! So excited!!!! Can’t wait!! WE will be visiting next week. 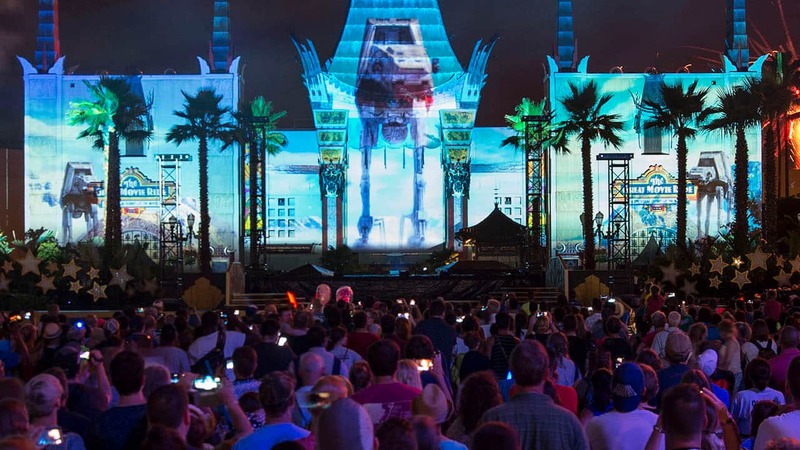 What time will the Frozen Holiday Wish begin on the 5th-8th? Will it take place during the Very Merry Christmas Party? April – Both! It’s at 6:15 p.m. every night and again at 8 p.m. on party nights. Yes, and the Christmas party too! Any chance the heinous Prince Hans will be showing his mug at this or other related events? Ryan – They won’t be in this show, but Mickey and the gang are still the stars of the party! You’ll be able to see them in “Celebrate the Season” on the Castle Forecourt Stage, in “Mickey’s Once Upon a Christmastime Parade,” and more. I think it should still be Cinderella and Fairy Godmother. After all, it is still Cinderella’s castle right? To answer your question, the show will happen every night at 6:15 p.m., with additional performances at 8:00 p.m. on Mickey’s Very Merry Christmas Party nights. YES! What time will this be at night? and where there be a fastpass/reserve seating area? Alison – The show will be presented nightly at 6:15 p.m., with an encore performance at 8:00 p.m. on Mickey’s Very Merry Christmas Party nights. There is no reserved viewing area for this show. I hope the castle lighting show will stay in place through Marathon weekend! We’ll be there week of Thanksgiving! Our kids (even the boys) can’t wait for this! Will Cinderella be in the show? Kellie – No. This is an entirely new castle lighting show featuring Anna, Elsa, Kristoff, and Olaf. PLEASE tell me that Celebrate the Season will still be playing. Ryan – Yes! “Celebrate the Season” will be presented on the Castle Forecourt Stage as usual during Mickey’s Very Merry Christmas Party. Yes we will be there to see it. How long does the show last? I hope its not just a quick few minutes…..
Will the castle still be lit up through the New Years weekend? Juan – December 31 is the final day for “A Frozen Holiday Wish,” but the Castle Dream Lights will continue nightly through the first week or so of January. We are comming for christmas!! Will this happen on Nov 7th prior to the Christmas Party? Darlene – Yes! “A Frozen Holiday Wish” will be presented every evening during regular park hours, as well as during Mickey’s Very Merry Christmas Party.